This has been a very busy summer for me, and I think the pace is accelerating. What started as a few outings a week has become a marathon of summer activities. My daughter has been even busier than I have, having gone out to somewhere exciting almost every single day since June. She’s gone to the zoo a couple of times this summer, to the Children’s Museum, to Folk Fest, to Kids Fest… she actually missed the kids shows at Fringe due to scheduling conflicts; my 16-month old daughter has more scheduling conflicts than I’ve ever had. This past weekend we had Ballet in the Park, Sesame Street Live, a social gathering, strawberry picking, a beach visit, a farm visit, and a family dinner. Coming in August: Folklorama, a trip to another beach, a trip to the Whiteshell, and perhaps a return visit to Hecla (her third trip to the island). This in addition to her trips down Corydon, in the Exchange, to the Forks, to the dog park, etc. Even if I took every day off for the rest of the summer, I don’t think we’d be able to show my daughter everything we’d like her to see in and around Winnipeg. ChrisD.ca just reminded me via Twitter about the Winnipeg Beach boardwalk; we haven’t been there at all this year. Over the next week or so, I’m going to talk about some of these jewels of Winnipeg. I won’t focus on their history or take any photos, because there are already some very good people doing just that (Mr. Christian, Bryan Scott). But I’ll talk about what’s happening now, what we’ll hopefully see in the near future, and I’ll mention the hazards ahead. 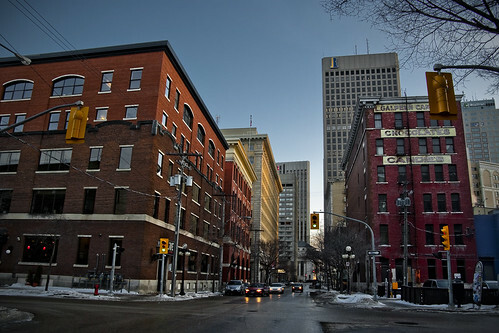 The Exchange District is North America’s most extensive collection of turn-of-the-20th-century architecture, and is also a place that is becoming livelier by the day. New businesses are moving in, more residents are on their way, and the cultural events keep growing. There are many jewels in Winnipeg, but the Exchange District is the jewel that’s most likely to put us on the map. In fact, the Exchange District is the downtown of the month for the International Downtown Association. The Exchange District is teeming with events, particularly in the summer, but with galleries, music venues, and theatres offering year-round entertainment. This summer has already seen the Winnipeg Jazz Festival, the Soca Reggae Festival, and the Fringe Festival in the heart of the Exchange District. There are also festivals at other times of year in the Exchange, including the Winnipeg Symphony Orchestra’s New Music Festival and Manitoba Theatre Centre’s Master Playwright Festival, which features the work of a different playwright each year. 2009 was MillerFest (Arthur Miller), and 2010 will see ChurchillFest in honour of Caryl Churchill. A portion of the Exchange District, around 20 blocks, is a National Historic Site. In theory, this should offer protection to heritage buildings, but there is definite concern among many heritage-minded Winnipeggers that many of the buildings could be demolished simply because they are not deemed “interesting” or “historic” enough. For instance, the Grain Exchange Annex will soon be demolished to create a loading zone and surface lot. The reasoning used by the city, the property owner, and even Heritage Winnipeg was that the building was not significant enough, and that it was built in 1920 as opposed to 1913 (the “upper limit” for the described characteristics of the national historic site), so it was not considered historic. Glengarry Block and Allen Building: two of the three buildings that Manitoba Hydro had hoped to convert to a substation. The third, the Daylite Building, has Grade II protection. This still may not prevent a future effort by the Manitoba government Crown Corporation to gut the interiors of these buildings for its equipment. 165 – 179 McDermot Avenue: this strip of six buildings on McDermot is one of the best preserved streetscapes in the district. Bailey’s Restaurant, a building built in 1900, isn’t even on the historic buildings list, which means that it has no heritage protection at all. The Exchange District, while only home to around 600 people at present, is slowly gaining in residential population and in services. Most Winnipeggers have heard of the new condos being built along Waterfront Drive (The Strand, The Excelsior, Sky Waterfront Condominiums, Ship Street Village), but not as many people are aware of The Edge on Princess. This is a heritage building converted to New York style loft apartments, with bachelors priced at $750/month, including heat, water, and electric. One bedrooms are priced at $950-1,150 and there are also some two bedroom units available. Another interesting project is YouCube, which promises a total of 18 townhouse condos priced between $196,450 and $300,000. Other condos in the Exchange are Fairchild Lofts at 110 Princess St and Old Market Square Lofts at 283 Bannatyne Ave. Due to the high price of homes in the Exchange District, the incoming population will be composed mainly of affluent professionals. However, there will soon be a 100-strong student component as well as the Union Bank Tower is renovated into a space that will include the Red River College hospitality programs as well as the college’s first student residence. Now Entering Winnipeg / We were born here, what’s your excuse? But the reality is that several accidents of history and geography have blessed us with a one-of-a-kind historic commercial district, and the people of Winnipeg have filled the district with culture and excitement and commerce. Our next steps should be to start leveraging our billion-dollar asset into a genuine international draw. This isn’t done simply by throwing money at the Exchange, although there are dozens of buildings that could use some money for restoration and renovation. It’s done by building up the amount of attractions within the district, growing the number and size of festivals and events, and capitalizing on what we already have. I won’t go into details on this today, but I’m sure we all have a few ideas on what could come next for the Exchange. I can’t think of a more exciting time for Winnipeg since the turn of the century, when we were the Chicago of the North. And a large part of that excitement is coming from Winnipeg Jewel #1: the Exchange District. Even if I took every day off for the rest of the summer, I don’t think we’d be able to show my daughter everything we’d like her to see in and around Winnipeg. ChrisD.ca just reminded me about the Winnipeg Beach boardwalk; we haven’t been there at all this year. The only way to save this area is to legislate that traffic be sent there. The salvation is educational facilities. But since it is impossible to even think about building Faculties outside Fort Garry, you’ll have to dig deep within your pockets to come up with the money to save these buildings. Smart money won’t drop a penny unless they are guaranteed a return. What little conversions are taking place don’t even come close in establishing a presence. You want a presence, be prepared to create one. For me. university faculties bringing 10 to 20 thousand students to the area every day is something that can be accomplished without waiting for someone or something to be created. Call me crazy, but I think Red River has clearly demonstrated that the Exchange can become a center of education which may attract international interests. Add in a Faculty of Arts , business , Law, Architecture and perhaps you’ll have a catalyst that will create something of interest. But you know what, thats to crazy a concept for Winnipeg to even consider. @Mr. Nobody: Do you know exactly why there is no thought to moving something like the Faculty of Architecture to the Exchange? I know that with the new property acquisition, the U of M has some nearby expansion planned, so maybe that’s the reason? I don’t think there is any thought to moving faculties because you have a campus mentality with very little consideration for the health of the City. But one Faculty won’t make a big difference. The 90’s perhaps represented the best possible time for this move to have been taken. The area was in a state of rot and stagnation as was the university.. That being said, perhaps no one gave/gives it a thought. All I know is that the university is spending hundreds of millions rebuilding /refurbishing old Faculties including building new residences. And the City is going to spend close to 400 million getting there. Not a good investment in my opinion. I am puzzled why anyone can’t connect the dots and see the irony of this buildout in Fort Garry while the core twiddles its thumb waiting for a concept. Very very strange place this town of ours.